Super Charge Your Linux Skills: The Linux command shell isn't magic – anyone can learn it. The 9th Edition of the Linux Shell Handbook provides a comprehensive look at the world inside the terminal window. The print edition is sold out. To order the digital edition, please click here. 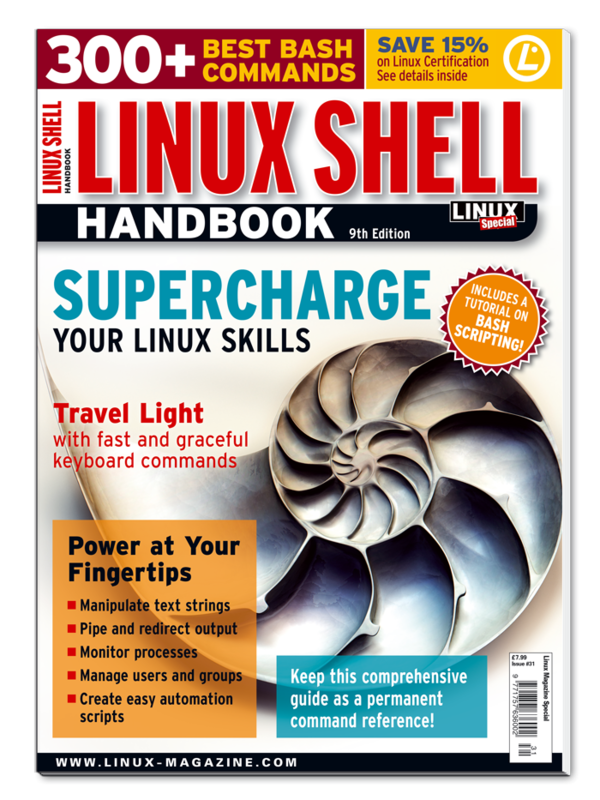 Exclusive Bonus: This edition of the Shell Handbook includes special discounts from Linux Professional Institute. Save 15% on DevOps and LPI-C certification! The Linux command shell isn't magic – anyone can learn it. This Linux Shell special edition provides a comprehensive look at the world inside the terminal window. We show you how to navigate directories and manage your file resources. Handy tools like find, locate, and whereis help you chase down files and programs on your system. Regular expressions work with other tools to filter data and help you find the snippet you really need. We show you how to match characters with regular expressions. Learn how to direct the output of one command to another command. Get more productive by customizing the command-line environment. Why slow down for a mouse? You can use some simple command-line tools to search, sort, cut, paste, join, and split your text files to zero in on the information you need. Learn about some tools for configuring and managing devices. Use these handy disk partitioning utilities to configure your hard drive before you install a new operating system. You can't store files without a filesystem. Use these Bash commands for easy filesystem configuration. Most Linux distros mount storage media automatically, but someday you might need a classic command-line tool. These utilities let you set and keep time. Explore some tools for managing users and groups. Protect your file and directory resources with these commands for managing file security settings. Why log in to the root account if you can avoid it? Monitor and manage the processes running on your system. Linux package tools help you install and manage software. We show you some package tools for Fedora, Arch, and Debian-based systems. Create backups and bootable CDs with these handy disc utilities. Use the classic ftp tool to upload and download files. Wireless networking requires some special tools. Automate and schedule common tasks. We show you how to start writing your own Bash scripts. Use these picture perfect command-line tools to convert and adapt your digital images.